December 1776 seemed far removed from July's Declaration of Independence. July's promise was unlikely to survive to see the Spring. Washington's army had been forced to retreat to New Jersey from New York. What had been a force of 30,000 had been reduced to 3,000. From the New Jersey Palisades, Washington watched the British take Fort Washington and put its 3,000 defenders to the sword. The British intended to shatter American resolve by destroying their army and they had a pretty good start. Amnesty was offered to all who would declare loyalty to the crown and thousands took the offer, including one signer of the Declaration of Independence. Washington desperately needed a victory to shore up his army, support enlistments, and end the desertions. Even the General had begun to lose his resolve, writing in his diary "I think the game is pretty near up." A garrison of Hessian troops hired by the King of England sat in Trenton, across the Delaware River from the remainder of Washington's force. It provided a ripe, albeit well fortified, target. On Christmas Day, the weather was bleak and frozen. Deciding that no maneuvers could be made in such weather, the Hessians relaxed and prepared a feast of roast goose and rum. Washington's men, many with rags tied around their feet, braving rain, hail, and snow, spent the day finding boats to make the crossing. 2,400 men started the crossing at nightfall. The crossing continued until 3:00 AM the next morning through treacherous currents and ice flows. A nine mile march to Trenton remained before the Patriots through a driving snow storm. They would fail to make it there before daybreak and Washington considered calling the whole thing off. Yet, the men seemed "to vie with the other in pressing forward," Washington would later say. The Hessians woke to see an army appear out of the driving snow. The battle lasted 45 minutes. 22 Hessians were killed, 83 serious wounded, and 900 captured. Washington lost two men. Of the battle, British Historian George Trevelyan wrote, "It may be doubted whether so small a number of men ever employed so short a space of time with greater and more lasting effects upon the history of the world." Washington followed this victory with another at Princeton. Washington turned the tide of the war and had his countrymen believing that Independence might be more than just a dream. 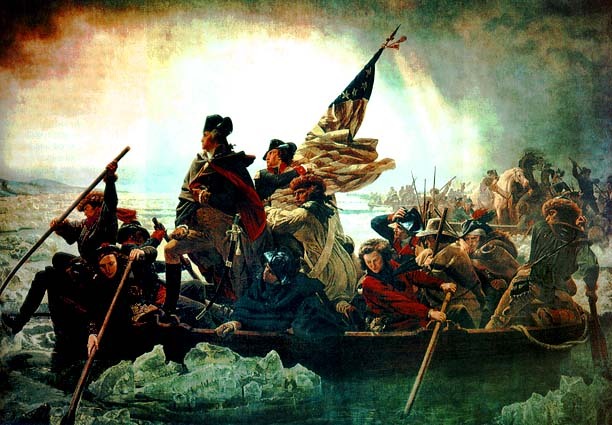 Washington and his men exemplified something that became part of our national character--the ability to rise to the challenge and win even against all odds and at the last possible moment. We pray that God would not let this aspect of our character fall away or let us forget it. Merry Christmas!